Trump Begins to Reverberate in Mexico’s Presidential Elections Why Would an Immigrant Support Trump? 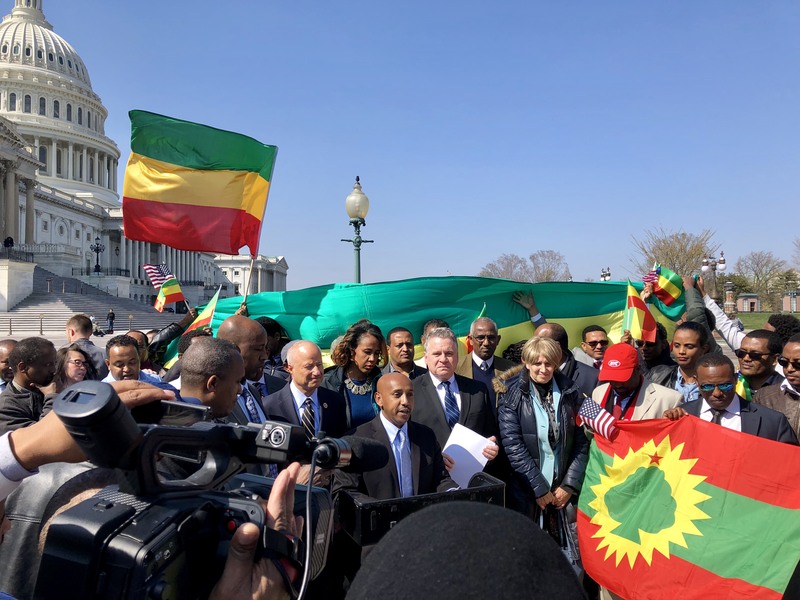 Tewodrose Tirfe, chair of the Amhara Association of America, addresses press and supporters outside Washington’s Capitol Building after passage of House Resolution-128. Behind and to his left is Congressman Chris Smith and behind and to his right is Congressman Mike Coffman, both of whom played key roles in the resolution’s successful passage. Photo courtesy Tewodrose Tirfe/Congressman Mike Coffman’s office. Crucially, he heralds from the Oromo People’s Democratic Organization (OPDO), which represents the Oromo, Ethiopia’s largest ethnic group, and who have spearheaded protests against the ruling Ethiopian People’s Revolutionary Democratic Front (EPRDF) coalition party, of which the OPDO is a key member. After the resignation of previous Prime Minister Hailemariam Desalegn, many warned that if the EPRDF chose a figure from its old guard it might well lead to more, perhaps worse, unrest. That has been avoided with the party embracing a politician with greater public support, and the first Oromo head of government in Ethiopia has already traveled to several areas of the country, promising to address grievances and strengthen a range of political and civil rights. But, as everyone knows and agrees on, Abiy faces numerous challenges domestically and externally in bringing stability back to Ethiopia and settling a discontented populace that is the second largest in Africa. One problem is the state of emergency declared in Ethiopia in February following the last prime minister’s surprise resignation (and which is the second state of emergency after the first ended in August 2017). This could hinder Abiy in moving forward with any reform agenda, because the new prime minister’s hold on the state security apparatus is much reduced than normal during a state of emergency, with a group of military officers referred to as the “Command Post” effectively in control of the mechanism of the state. Also, the very fact of Abiy’s reluctance to push for the lifting of the state of emergency illustrates, observers say, how the internal dynamics of the EPRDF that played a large part in the undoing of Desalegn are still a force to be reckoned with. The historical dominance of the Tigrayan People’s Liberation Front (TPLF) in the EPRDF continues to wield force and means Ethiopia’s new, apparently reformist, prime minister will need to deal shrewdly with members of the establishment resistant to reform or reconciliation efforts—if Abiy is, in fact, genuinely for reform, that is. Nevertheless, whatever the inner workings of the new prime minister’s mind, as an ex-army officer he understands the military-security apparatus and its culture; he has a strong party mandate and public support behind him, and he comes to power at a time when those previously in charge are reviled by the populace, thereby putting him in a unique position to potentially resolve many of the country’s problems. The resolution and its wording deeply angered the Ethiopian government, which even suggested it might cut off security cooperation with the US if the resolution was passed. Ethiopia is viewed by the US as its most important ally in the volatile East African region, and hence receives one of the largest security and humanitarian aid packages among sub-Saharan African countries. Congressman Chris Smith, Chairman of the House Subcommittee of Africa, Global Health, Global Human Rights, and International Organizations, introduced HR-128, and played a major role, along with Congressman Mike Coffman, in achieving the passage of the resolution. Essentially, Tewodros explains, this would tie aid to improved governance and more scrutiny of support given, because even though resolutions aren’t laws and are non-binding, if they have strong bipartisan support—like HR-128—coupled with the fact that Congress has the power of oversight, then agencies named in the resolutions would seriously consider implementing the terms of these declarations. Furthermore, the Amhara Association of America and other advocacy partners are working to introduce binding legislation that would be signed by the president and would become the law directing how the US deals with Ethiopia. “We believe this is a much easier task now since the Ethiopian diaspora groups are activated and engaged, the policy makers are educated, and we have built strong bipartisan support in Congress,” Tewodrose says. That said, opposition exists in the Senate to the senate resolution, and there is still some way to go before a new law guiding US foreign policy towards Ethiopia emerges. But any resolution about Ethiopia, such as HR-128, could still have an impact on the actions of the Ethiopian regime and the new prime minister’s reform agenda. Previously, though the US government was aware of well-documented problems with regards to human rights abuses, lack of democracy promotion and corruption at the highest levels of the Ethiopian state, it didn’t forcefully act to pressure Ethiopia’s government. But the House resolution signals a shift in that approach. Besides condemning killings, detentions, and abuse of Ethiopia’s Anti-Terror Proclamation, the resolution also makes more ambitious demands of the Ethiopian regime including reforms that would protect the Ethiopian people’s civil liberties and release political prisoners, views that the new prime minister is also believed to share. While HR-128 is an important development, what further US legislation, if any, follows it, is likely to have the most tangible impact on strengthening—or not—the hand of the new prime minister in persuading those power brokers within the EPRDF who control country’s security apparatus and the intelligence and economic sectors, to participate in negotiations for reform.